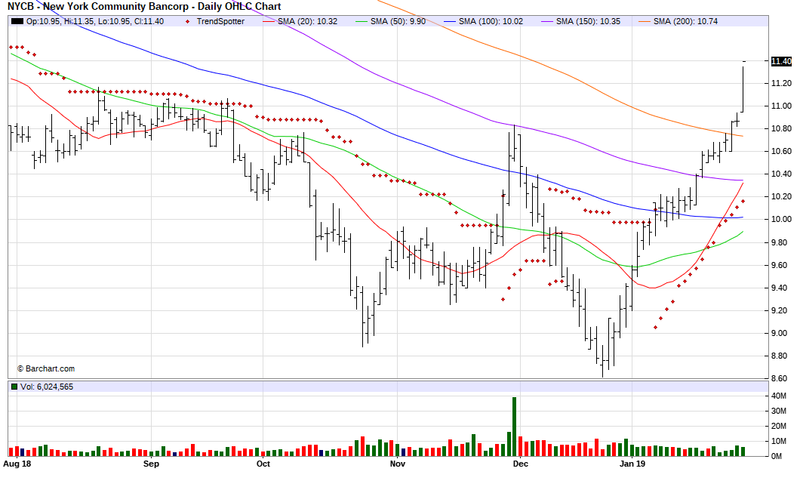 The Barchart Chart of the Day belongs to the loan producer New York Community Bancorp (NYCB). I found the stock by sort Barchart's Top Stocks to Own list first by the most frequent number of new hihgs in the last month, then I used the Flipchart feature to review the charts for consistent price appreciation. Since the Trend Spotter signaled a buy on 1/9 the stock gained 12.0%. New York Community Bancorp, Inc. is a leading producer of multi-family loans in New York City, with an emphasis on apartment buildings that feature below-market rents. The Company has two bank subsidiaries: New York Community Bank, with 178 branches serving customers throughout Metro New York and New Jersey; and New York Commercial Bank, with 36 branches serving customers in Manhattan, Queens, Brooklyn, Long Island, and Westchester County in New York. Reflecting its growth through a series of acquisitions, the Community Bank operates through five local divisions: Queens County Savings Bank in Queens, Roslyn Savings Bank on Long Island, Richmond County Savings Bank on Staten Island, Roosevelt Savings Bank in Brooklyn, and Garden State Community Bank in New Jersey. Similarly, the Commercial Bank operates 17 of its branches under the name Atlantic Bank.